Adson forcep 1 x 2 teeth 12cm/5"..
Iris forcep 1 x 2 teeth 12cm/5".. 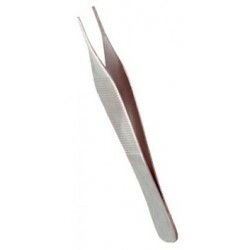 Thumb dressing forcep 3 1/2" serr..
Feilchen feld splinter forcep 3-1/2"..
Kelly forcep str. 14cm/5 1/2"..
Kelly forcep cvd 14cm/5 1/2"..
Rochester pean forcep 10" str..
Rochester pean forcep 10" cvd..